As a LEAPWORK user, your license type (Platform License or Single-User License) determines your access to the LEAPWORK Automation Platform. More about the LEAPWORK licenses and deployment. All licenses are installed on the Controller using Studio as the interface. Use a Single-User License if you are the sole user of LEAPWORK, and the entire platform is operated from one PC. Use a Platform License when you and members of your team need to collaborate on designing, maintaining, and running automation flows. In both cases, the licenses are applied and activated as part of the installation process or added after acquiring more Agents to a Controller. The active license configuration is available at Settings --> License Management. Adding additional resources to an existing license (e.g., additional Agents) is possible by contacting LEAPWORK. 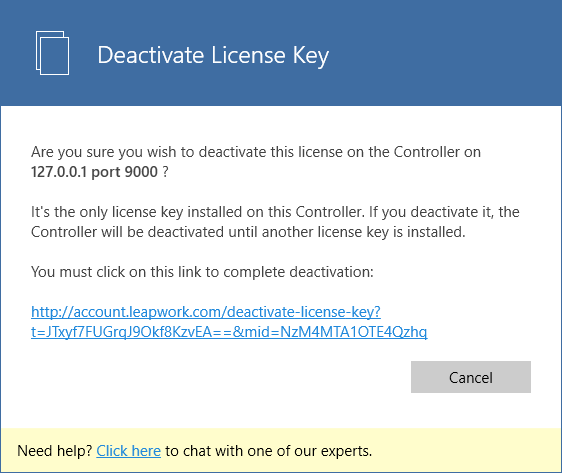 LEAPWORK will issue a new subscription covering the additional components which you can then add using the 'Add license' button. Click on the link to login to your account at leapwork.com. If you experience problems with login to the account management page, please contact LEAPWORK. Select the kind of license to generate a license key for. 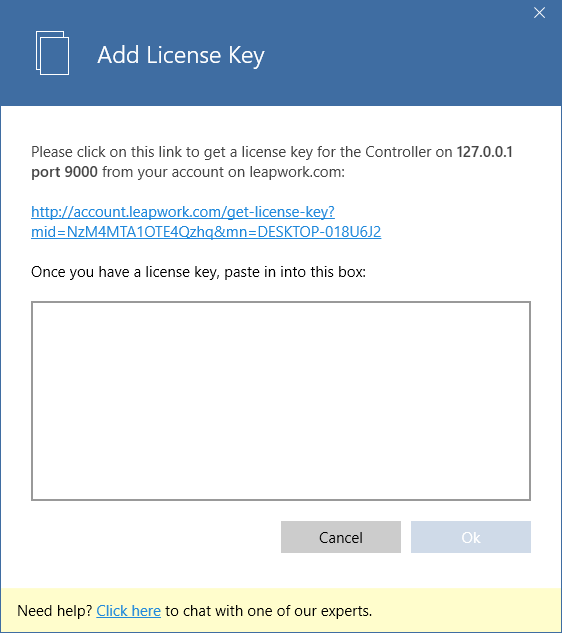 It is possible to generate license keys for Agents only and add them to an existing Controller. Specify the number of Agents to add to the license, unless the license type is 'Controller only'. This is a list of the purchased subscriptions, both active and expired. Each subscription shows how many unused Controllers and Agents are available for the subscription, and the expiration date for the subscription. 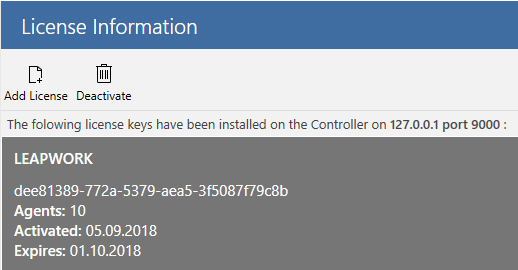 Whenever you generate a license key it is added to the license key list. It is possible to download this list. Back in Studio, paste the generated license key into the license key field and click OK. This will add the license to the License overview for the Controller. Each license will clearly display the agreed configuration as well as duration. 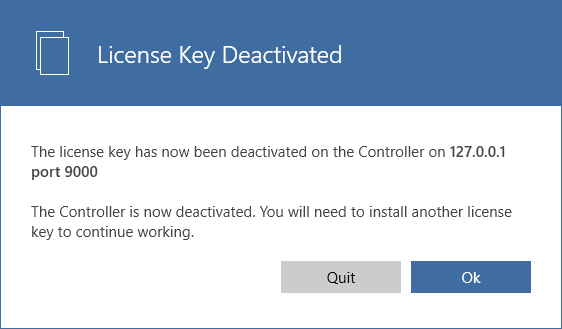 It is perfectly acceptable to deactivate a license to move it to another Controller machine or to remove all agents from one Controller and add it to another Controller. In both cases you will need to deactivate the licenses to free up the Controllers and Agents. Deactivation is always done from Studio by selecting the license to deactivate and then click 'Deactivate'. This will open a confirmation dialogue including a link to perform the actual deactivation. After clicking the link, a confirmation of the deactivation is shown. 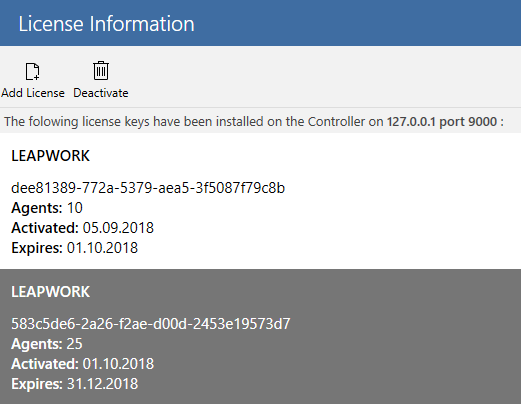 If you have removed the last active license from a Controller, you will need to add a new license to the Controller before it will be accessible.